Here is a great article called: What Are the Best Shakespeare Movies? John Fords western about Wyatt Earp has an unforgettable scene where a traveling actor (Alan Mowbrey) stumbles through Hamlets To be or not to be soliloquy in a barroom full of drunks. 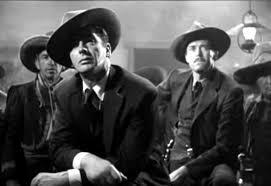 When he forgets his lines, Doc Holliday (Victor Mature) leans forward and finishes the speech. And in that handoff, when Shakespeares words are taken out of the mouth of an actor and taken up by a spectator in a saloon, something too familiar suddenly comes to life. We hear what Hamlets saying because its not Hamlet, its Doc saying the wordsa man living with the death sentence of tuberculosis, which puts him on more than a nodding acquaintance with matters of life and death. And yes, Ford is riding on Shakespeares shoulders here, but this is still one of the most transcendent and touchingyet unsentimentalscenes in any movie. "